Al-Masjid an-Nabawī (Arabic: ٱلْـمَـسْـجِـدُ ٱلـنَّـبَـوِيّ‎, "The Prophet's Mosque") is a mosque established and originally built by the Islamic Prophet Muhammad, situated in the city of Medina in the Hejaz region of Saudi Arabia. It was the third mosque built in the history of Islam,[a] and is now one of the largest mosques in the world. It is the second-holiest site in Islam, after the Great Mosque in Mecca. It is always open, regardless of date or time. The site was originally adjacent to Muhammad's house; he settled there after his migration from Mecca to Medina in 622. He shared in the heavy work of construction. The original mosque was an open-air building. The mosque served as a community center, a court, and a religious school. There was a raised platform for the people who taught the Quran. Subsequent Islamic rulers greatly expanded and decorated it. In 1909, it became the first place in the Arabian Peninsula to be provided with electrical lights. The mosque is under the control of the Custodian of the Two Holy Mosques. The mosque is located in what was traditionally the center of Medina, with many hotels and old markets nearby. It is a major pilgrimage site. Many pilgrims who perform the Hajj go on to Medina to visit the mosque, due to its connection to Muhammad. After an expansion during the reign of the Umayyad caliph al-Walid I, it now incorporates the final resting place of Muhammad and the first two Rashidun caliphs Abu Bakr and Umar. One of the most notable features of the site is the Green Dome in the south-east corner of the mosque, originally Aisha's house, where the tomb of Muhammad is located. In 1279, a wooden cupola was built over the tomb which was later rebuilt and renovated multiple times in late 15th century and once in 1817. The current dome was added in 1818 by the Ottoman sultan Mahmud II, and it was first painted green in 1837, hence becoming known as the "Green Dome". View of Masjid-e-Nabawi Gate 21, 22 as seen from the north, the gate with two minarets is bab malik al-Fahad. The mosque was built by Prophet Muhammad in 622, after his arrival in the city of Medina. Riding on a camel called Qaswa he arrived at the place where this mosque was built. The land was owned by Sahal and Suhayl, partly as a place for drying dates, and at one end had been previously used as a burial ground. Refusing to "accept the land as a gift", he bought the land and it took seven months to complete the construction of the mosque. It measured 30.5 m × 35.62 m (100.1 ft × 116.9 ft). The roof which was supported by palm trunks was made of beaten clay and palm leaves. It was at a height of 3.60 m (11.8 ft). The three doors of the mosque were Bab-al-Rahmah to the south, Bab-al-Jibril to the west and Babal-Nisa to the east. After the Battle of Khaybar, the mosque was "enlarged". The mosque extended for 47.32 m (155.2 ft) on each side and three rows of columns were built beside the west wall, which became the place of praying. The mosque remained unaltered during the reign of the first Rashidun caliph Abu Bakr. The second caliph Umar demolished all the houses around the mosque except that of Muhammad's wives to expand it. The new mosque's dimensions became 57.49 m × 66.14 m (188.6 ft × 217.0 ft). Sun-dried mud bricks were used to construct the walls of the enclosure. Besides strewing pebbles on the floor, the roof's height was increased to 5.6 m (18 ft). Umar moreover constructed three more gates for entrance. He also added the Al-Butayha for people to recite poetry. The third caliph Uthman demolished the mosque in 649. Ten months were spent in building the new rectangular shaped mosque whose face was turned towards the Kaaba in Mecca. The new mosque measured 81.40 m × 62.58 m (267.1 ft × 205.3 ft). The number of gates as well as their names remained the same. The enclosure walls were made of stones laid in mortar. The palm trunk columns were replaced by stone columns which were joined by iron clamps. Teakwood was used in reconstructing the ceiling. In 707, Umayyad caliph Al-Walid ibn Abd al-Malik renovated the mosque. It took three years for the work to be completed. Raw materials were procured from the Byzantine Empire. The area of the mosque was increased from 5094 sq. metre of Uthman's time to 8672 sq metre. A wall was built to segregate the mosque and the houses of the wives of Prophet Muhammad. The mosque was reconstructed in a trapezoid shape with a length of 101.76 metres (333.9 ft). For the first time, porticoes were built in the mosque connecting the northern part of the structure to the sanctuary. For the first time, minarets were built in Medina as he constructed four minarets around it. Abbasid caliph Al-Mahdi extended the mosque to the north by 50 metres (160 ft). His name was also inscribed on the walls of the mosque. He also planned to remove six steps to the minbar, but abandoned this idea, owing to this causing damage of the woods on which they were built. According to an inscription of Ibn Qutaybah, the third caliph Al-Mamun did "unspecified work" on the mosque. Al-Mutawakkil lined the enclosure of Prophet Muhammad's tomb with marble. Al-Ashraf Qansuh al-Ghawri built a dome of stone over his grave in 1476. The Green Dome, in Richard Francis Burton's Pilgrimage, ca. 1850 CE. The Rawdah (referred to as al-Rawdah al-Mutaharah), covered by the dome over the south-east corner of the mosque, was constructed in 1817C.E. during the reign of Sultan Mahmud II. The dome was painted green in 1837 C.E. and came to be known as the "Green Dome". The Sultan Abdul Majid I took thirteen years to rebuild the mosque, which started in 1849. Red stone bricks were used as the main material in reconstruction of the mosque. The floor area of the mosque was increased by 1293 square metre. On the walls, verses from the Quran were inscribed in Islamic calligraphy. In the northern side of the mosque, a madrasah was built for "teaching Quranic lessons". When Saud bin Abdul-Aziz took Medina in 1805, his followers, the Wahhabis, demolished nearly every tomb dome in Medina in order to prevent their veneration, and the Green Dome is said to have narrowly escaped the same fate. They considered the veneration of tombs and places thought to possess supernatural powers as an offence against tawhid.Prophet Muhammad's tomb was stripped of its gold and jewel ornaments, but the dome was preserved either because of an unsuccessful attempt to demolish its hardened structure, or because some time ago Ibn Abd al-Wahhab wrote that he did not wish to see the dome destroyed despite his aversion to people praying at the tomb. Similar events took place in 1925 when the Saudi ikhwans retook—and this time managed to keep—the city. After the foundation of the Kingdom of Saudi Arabia in 1932, the mosque underwent several major modifications. In 1951 King Ibn Saud (1932–1953) ordered demolitions around the mosque to make way for new wings to the east and west of the prayer hall, which consisted of concrete columns with pointed arches. Older columns were reinforced with concrete and braced with copper rings at the top. The Suleymaniyya and Majidiyya minarets were replaced by two minarets in Mamluk revival style. Two additional minarets were erected to the northeast and northwest of the mosque. A library was built along the western wall to house historic Qurans and other religious texts. In 1974, King Faisal added 40,440 square metres to the mosque. The area of the mosque was also expanded during the reign of King Fahd in 1985. Bulldozers were used to demolish buildings around the mosque. In 1992, when it was completed, the area of the mosque became 1.7 million square feet. Escalators and 27 courtyards were among the additions to the mosque. A $6 billion project for increasing the area of the mosque was announced in September 2012. After completion, it could accommodate between 1.6 million to 2 million worshippers. In March of the following year, Saudi Gazette reported that demolition work had been mostly complete, including the demolition of ten hotels on the eastern side, in addition to houses and other utilities. The two tiered mosque has a rectangular plan. The Ottoman prayer hall lies towards the south. It has a flat paved roof topped with 27 sliding domes on square bases. Holes pierced into the base of each dome illuminate the interior. The roof is also used for prayer during peak times, when the domes slide out on metal tracks to shade areas of the roof, creating light wells for the prayer hall. At these times, the courtyard of the Ottoman mosque is also shaded with umbrellas affixed to freestanding columns. The roof is accessed by stairs and escalators. The paved area around the mosque is also used for prayer, equipped with umbrella tents. Sliding domes and retractable umbrella-like canopies were designed by the German architect Mahmoud Bodo Rasch, his firm SL Rasch GmbH, and Buro Happold. The Rawḍah (Arabic: رَوْضَـة‎, literally "Garden") is an area between the minbar and burial chamber of Muhammad. It is regarded as one of the riyāḍ al-Jannah (Arabic: رِيَـاض الْـجَـنَّـة‎, gardens of Paradise). A green carpet distinguishes the area from the rest of the mosque, which is covered in a red carpet. Pilgrims attempt to visit the confines of the area, for there is a tradition that supplications and prayers uttered here are never rejected. Access into the area is not always possible, especially during the Hajj season, as the space can only accommodate a few hundred people. The chamber adjacent to the Rawdah holds the tombs of Prophet Muhammad and two of his companions, father-in-laws and caliphs, Abu Bakr and Umar ibn al-Khattab. A fourth grave is reserved for ‘Īsā (Arabic: عِـيـسَى‎, Jesus), as it is believed that he will return and will be buried at the site. The site is covered by the Green Dome. It was constructed in 1817 CE during the reign of the Ottoman sultan Mahmud II and painted green in 1837 CE. There are two mihrabs in the mosque, one was built by Muhammad and another was built by the third Rashidun caliph Uthman. The one built by the latter was larger than that of Muhammad's and act as the functional mihrab, whereas Muhammad's mihrab is a "commemorative" mihrab. Besides the mihrab, the mosque also has other niches which act as indicators for praying. This includes the miḥrâb Fâṭimah (Arabic: مِـحْـرَاب فَـاطِـمَـة‎) or miḥrāb aṫ-Ṫahajjud (Arabic: مِـحْـرَاب الـتَّـهَـجُّـد‎), which was built by Muhammad for the Ṫahajjud (Arabic: تَـهَـجُّـد‎). The original minbar (Arabic: مِـنـۢبَـر‎) used by Muhammad was a "wood block of date tree". This was replaced by him with a tamarisk one, which had dimensions of 50 cm × 125 cm (20 in × 49 in). Also in 629, a three staired ladder was added to it. The first two caliphs, Abu Bakr and Umar, did not use the third step "due to respect for the Prophet", but the third caliph Uthman placed a fabric dome over it and the rest of the stairs were covered with ebony. The minbar was replaced by Baybars I in 1395, and later by Shaykh al-Mahmudi in 1417. This was also replaced by a marble one by Qaitbay in the late fifteenth century, which as of August 2013, is still used in the mosque. The first minarets (four in number) of 26 feet (7.9 m) high were constructed by Umar. In 1307, a minaret titled Bab al-Salam was added by Muhammad ibn Kalavun which was renovated by Mehmed IV. After the renovation project of 1994, there were ten minarets which were 104 metres (341 ft) high. The minarets' upper, bottom and middle portion are cylindrical, octagonal and square shaped respectively. ^ Google maps. "Location of Masjid an Nabawi". Google maps. Retrieved 24 September 2013. ^ a b c d e f Ariffin, Syed Ahmad Iskandar Syed (2005). Architectural Conservation in Islam : Case Study of the Prophet's Mosque. Penerbit UTM. pp. 88–89, 109. ISBN 978-983-52-0373-2. ^ a b c Petersen, Andrew (2002-03-11). Dictionary of Islamic Architecture. Routledge. p. 183. ISBN 978-0-203-20387-3. ^ "The Prophet's Mosque [Al-Masjid An-Nabawi]". Islam Web. Retrieved 17 June 2015. ^ a b c Ariffin, p. 49. ^ "Gates of Masjid al-Nabawi". Madain Project. Retrieved 18 March 2018. ^ a b Ariffin, p. 51. ^ Atiqur Rahman. Umar Bin Khattab: The Man of Distinction. Adam Publishers. p. 53. ISBN 978-81-7435-329-0. ^ NE McMillan. Fathers and Sons: The Rise and Fall of Political Dynasty in the Middle East. Palgrave Macmillan. p. 33. ISBN 978-1-137-29789-1. ^ Wahbi Hariri-Rifai, Mokhless Hariri-Rifai. The Heritage of the Kingdom of Saudi Arabia. GDG Exhibits Trust. p. 161. ISBN 978-0-9624483-0-0. ^ a b Ariffin, p. 65. ^ a b Mark Weston (2008). Prophets and princes: Saudi Arabia from Muhammad to the present. John Wiley and Sons. pp. 102–103. ISBN 978-0-470-18257-4. ^ Doris Behrens-Abouseif; Stephen Vernoit (2006). Islamic art in the 19th century: tradition, innovation, and eclecticism. BRILL. p. 22. ISBN 978-90-04-14442-2. ^ Peskes, Esther (2000). "Wahhābiyya". Encyclopaedia of Islam. 11 (2nd ed.). Brill Academic Publishers. pp. 40, 42. ISBN 90-04-12756-9. ^ "History of the Cemetery Of Jannat Al-Baqi". Al-Islam.org. ^ Mark Weston (2008). Prophets and princes: Saudi Arabia from Muhammad to the present. John Wiley and Sons. p. 136. ISBN 978-0-470-18257-4. ^ Vincent J. Cornell (2007). Voices of Islam: Voices of the spirit. Greenwood Publishing Group. p. 84. ISBN 978-0-275-98734-3. ^ Carl W. Ernst (2004). Following Muhammad: Rethinking Islam in the Contemporary World. Univ of North Carolina Press. pp. 173–174. ISBN 978-0-8078-5577-5. ^ "New expansion of Prophet's Mosque ordered by king". Arab News. Retrieved 19 June 2015. ^ a b "Prophet's Mosque to accommodate two million worshippers after expansion". Arab News. 26 September 2012. Archived from the original on 7 March 2017. Retrieved 27 November 2016. ^ "Expansion of the Prophet's Mosque in Madinah (3 of 8)". King Fahd Abdulaziz. Archived from the original on 4 March 2016. Retrieved 19 June 2015. ^ "Expansion of the two Holy Mosques". Saudi Embassy. Archived from the original on 24 September 2015. Retrieved 19 June 2015. ^ "Saudi Arabia plans $6bln makeover for second holiest site in Islam". RT. Retrieved 19 June 2015. ^ "Prophet's Mosque to house 1.6m after expansion". Saudi Gazette. Archived from the original on 22 December 2015. Retrieved 19 June 2015. ^ "Holy places: The Prophet's Mosque, Medina". Daily Monitor. Retrieved 19 June 2015. ^ MakMax (Taiyo Kogyo Group). "Large scale umbrellas (250 units) completed, covering the pilgrims worldwide with membrane architecture : MakMax". makmax.com. ^ Walker, Derek (1998). The Confidence to Build. p 69: Taylor & Francis. p. 176. ISBN 0-419-24060-8. ^ Malik ibn Anas. "14.5.11". Muwatta Imam Malik. ^ a b ""Islamic Guidelines for Visitors to the Prophet's Mosque"". Islam-QA. It is prescribed for the one who visits the Prophet's Mosque to pray two rakats in the Rawdah or whatever he wants of supplementary prayers, because it is proven that there is virtue in doing so. It was narrated from Abu Hurayrah that the Prophet said, "The area between my house and my mimbar is one of the gardens of Paradise, and my mimbar is on my cistern (hawd)." Narrated by al-Bukhari, 1196; Muslim, 1391. ^ a b c "The Prophet's Mosque". Last Prophet. Retrieved 19 June 2015. ^ Assuming that Islam started with Muhammad. Muslims believe that Islam did not start with him, but that it represents even previous Prophets, such as Jesus, David, Moses, Abraham, Noah and Adam. In addition, the Quran treats the Masjidayn (Arabic: مَـسْـجِـدَيْـن‎, literally "two places of prostration") of Al-Haram and Al-Aqsa as being no less old. Munt, Harry. The Holy City of Medina: Sacred Space in Early Islamic Arabia. Cambridge University Press. ISBN 978-1-107-04213-1. Fahd, Salem Bahmmam. Pilgrimage in Islam: A description and explanation of the fifth pillar of Islam. Modern Guide, 2014. ISBN 978-1-78338-174-6. 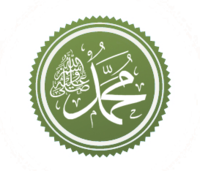 Hasrat Muhammad the Prophet of Islam. Adam Publishers. ISBN 978-81-7435-582-9. Muhammad, Asad. The Road To Mecca. The Book Foundation, 1954. ISBN 978-0-9927981-0-9. Sir, Richard Francis Burton. Personal Narrative of a Pilgrimage to Al-Madinah & Meccah, Volume 2. ISBN 978-0-486-21218-0. Wikimedia Commons has media related to Al-Masjid an-Nabawi. 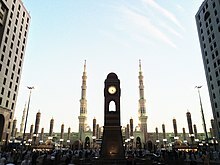 Wikivoyage has a travel guide for Medina. This page was last edited on 9 April 2019, at 14:44 (UTC).